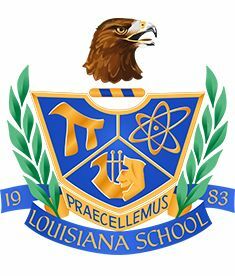 The Louisiana School for Math, Science, and the Arts, a preeminent state-supported residential high school with competitive admissions for high-achieving, highly-motivated students, fosters in young scholars lifelong growth toward reaching individual potentials and finding places of work and service in a global society through the examination and exchange of ideas in a community of learners. The crest is comprised of a variety of images that are symbols for LSMSA. The eagle is the mascot for LSMSA, and the eagle's head is displayed at the top of the crest. An eagle on a crest is used to symbolize a person of noble nature, strength, bravery and alertness. The shield symbolizes strength and protection. The laurel leaves on both sides of the shield stand for triumph or achievement. The school colors on the crest are blue and gold. Blue is associated with truth and loyalty, and gold is often used to signify a generous spirit and elevated thinking. The motto on the crest is a gold ribbon displaying the word, Praecellemus. Praecellemus means "We shall excel." When the students chose the motto in the spring of 1984, they really liked the idea of "we"; the use of the first person emphasizes the personal nature of the achievement LSMSA expects from everyone, and the first person plural represents the unity and "togetherness" of the school's living/learning environment. The banner on the crest displays the name of the school and the founding date of 1983. United in your noble name. As up above the eagles fly. Challenged, undaunted, and standing tall. We rise and conquer, give our all. Where heart and mind are bound.